We are delighted to announce that our Afghanistan Country Director, Dr Abdul Jalil Mohammadzai DVM, has won this year’s Animal Hero Awards’ Special Recognition Award for his dedication and innovative work helping thousands of animals in Afghanistan. The Daily Mirror’s Animal Hero Awards, in association with the RSPCA and Webbox, recognise and celebrate the most inspiring examples of bravery, dedication and resilience in the animal world. The judges, consisting of actor, Peter Egan, and TV presenter, Laura Whitmore, looked at thousands of entries that highlighted a whole range of animal plights from cruelty and neglect to animals that have gone above and beyond for their owners. Last night, the awards ceremony, which was hosted by actress and presenter Amanda Holden, took place at the Grosvenor House Hotel in central London. Dr Abdul Jalil Mohammadzai DVM, or Dr Mo as everyone knows him, was presented with a trophy by Mayhew ambassador Arlene Phillips. To win an award is a tremendous accolade and recognition for Dr Mo and the leading animal welfare initiatives he has implemented in Afghanistan. Dr Mo trained as a vet at Kabul University, graduating as the Taliban seized power. They dismissed veterinary science as useless and irrelevant and destroyed the University’s veterinary facilities. Dr Mo fled to the UK in 1997 and began volunteering at Mayhew, eventually working full time in London and back in his homeland. In that time, he has helped support the rebuilding of the clinic at Kabul University and helped Kabul Zoo not just recover from total destruction, but also transformed it into a well maintained, educational facility. Dr Mo is Country Director for Mayhew Afghanistan, a role which has seen him devise and implement the first ever dog population survey in Kabul. After Mayhew was established as an NGO in Afghanistan in August 2016, Dr Mo instigated and negotiated a ground-breaking agreement with Kabul City Authorities to end the cruel culling of street dogs in Kabul. He has developed an animal welfare strategy incorporating rabies prevention and control and dog population management programmes, negotiating with the Afghan Government to roll out the initiatives in Kabul and across Afghanistan in the long-term. With signed agreements with the relevant ministerial departments and city authorities in place, on 6th August 2017, Mayhew Afghanistan began implementing the first mass canine rabies vaccination programme in Kabul. So far Mayhew Afghanistan has vaccinated over 12,000 dogs through their mass canine vaccination programme in the capital city of Kabul. The figure is important as it is 70% of the dog population in Kabul that has now been vaccinated against rabies. This percentage figure is the accepted threshold required to break the chain of virus transmission and start creating herd immunity in the area where the vaccination programme is happening. As well as working on top level strategies for the country, over the years Dr Mo has effectively worked on the ground, facilitating the training and development of hundreds of vets and students at Kabul University. 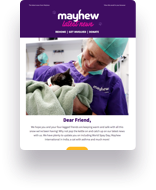 Mayhew’s CEO, Caroline Yates, added: “We are incredibly proud of Dr Mo and all that he has so far achieved. He is determined to improve animal welfare and veterinary standards in Afghanistan and to help the Afghan people and communities.